Illinois is in its eighth month without a budget, and Gov. Bruce Rauner isn't backing down from at least some of his "turnaround" agenda. As we've heard for months, social services agencies are feeling the pinch. So too are local governments. Cook County could be facing layoffs, as millions of dollars in unpaid bills pile up. Cook County Board President Toni Preckwinkle calls the impasse a “nightmare” for local units of government. 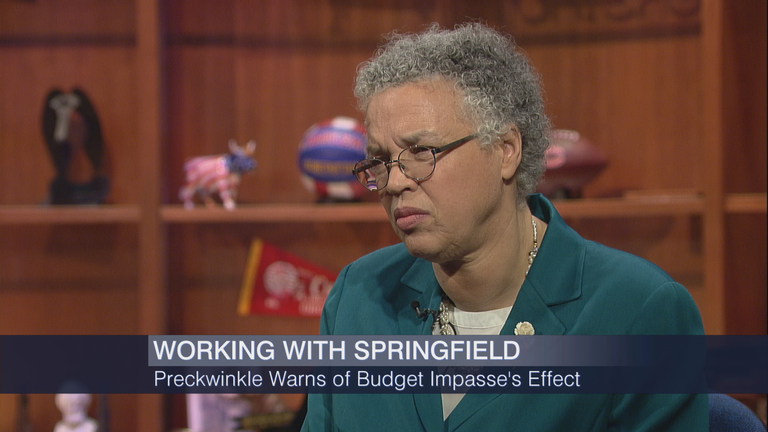 “His view – and frankly, it's my view, is that we need to disconnect the ‘turnaround’ agenda that the governor has put forward from passing the budget, which is a basic function of government,” Preckwinkle said. Below, some additional highlights from our conversation. On her support for state's attorney candidate Kim Foxx, who was slapped with a finding today by the State Board of Elections that she failed to report as a contribution a $25,000 poll that the Preckwinkle campaign financed while Foxx was still working for the county. "Should that give voters either pause about her judgment, or maybe about her indebtedness to you?" Marin asked. "Neither," said Preckwinkle. "We disagree with the finding. She wasn't a candidate at the time." "But once she was a candidate, and that poll was about the candidacy, is the Board of Elections 8-0 wrong about that assessment?" Marin asked. "I think so," Preckwinkle said. "I don't know what's going to happen, but I disagree with the finding." "I don't think the state's attorney has proven to be effective when it comes to cases of police misconduct of this magnitude," Preckwinkle said, calling the recent deaths of McDonald, Ronald Johnson, Philip Coleman and Cedrick Chatman at the hands of police officers "absolutely profoundly discouraging events." “And you agree with that,” said Marin. Watch the video to hear our full discussion. Below: Gov. Rauner delivers his budget address (jump to the 40-minute mark to see Rauner's entrance and speech). You can also read his speech as prepared for delivery. Gov. Bruce Rauner on Wednesday laid out two options for state lawmakers in his second budget address. Tonight, Amanda Vinicky joins us live from Springfield with more details of the governor’s budget proposal and response from Democratic legislative leaders. Dec. 14, 2015: Cook County Board President Toni Preckwinkle is calling for the resignation of Cook County State's Attorney Anita Alvarez in the wake of the shooting death of Laquan McDonald. Carol Marin talks with Preckwinkle about the crisis surrounding the Chicago Police Department and the sweeping probe of police patterns and practices by the DOJ.